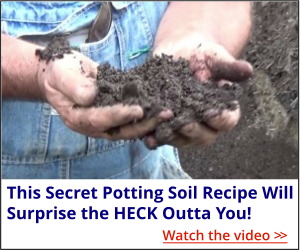 Home » Complete Guides » Rooting Cuttings in December and January. It’s really cold and snowy here in northern Ohio in December so that means no gardening right? Wrong! Here’s at Mike’s Plant Farm we have been crazy busy making and sticking cuttings. A bed full of hardwood cuttings. The bed on left are cuttings Hardwood Cuttings that we’ve stuck between November 15th and December 10th. These are known as hardwood cuttings and we have to wait for them to go completely dormant before we can even start doing them. Typically with hardwood cuttings you can start them after you have experienced a good, hard freeze. A hard freeze is a not a frost or even a heavy frost. It’s a night when the temperatures dip down below 28 degrees and stays there for a few hours. I use the Donkey’s Water Bucket as my freeze gauge. When I come in in the morning and their drinking water has frozen over I know that we have finally gotten the hard freeze that I am always looking for after November 15th. That’s usually when it occurs. I also know that it’s now time to change out the donkeys summer water bucket to their winter water bucket. The winter bucket has a built in heater that keeps their water from freezing. Once we get the hardwood freeze that we need to start our hardwood cuttings we usually go like crazy trying to get them all done before it gets so cold that we can no longer stick them outside. This year the weather was fairly reasonable after the hard freeze and we got a lot of them done, but last Thursday, December 8th, it was pretty cold and we had to actually remove about 2″ of soil from the top of the buckets because it was too frozen to work with. Some of our hardwood cuttings we stick in big pots once the bed of sand gets full. Yes, we root most of cuttings in coarse sand. Rooted and unrooted cuttings. This is where they will spend the winter. The bed to the far left are the hardwood cuttings that we just stuck. The bed next to those are softwood cuttings that we stuck in August, they are all rooted. The bed to the far right are cuttings that we stuck in June of 2015. They are still in the bed because we just don’t have room to pot them up until spring. And the bed to the middle right are cuttings that we stuck in June of 2016. You can see how much the cuttings actually grow while still in the propagation beds. Once the root through the sand into the soil below I won’t disturb them until they are dormant because it will shock them. Here you can see us removing cuttings just like this. Golden Curls Willow hardwood cuttings. Sometimes we stick our hardwood cuttings in big buckets like this filled with potting soil. This buckets also just sit outside like you see here. Come late spring, early summer, the cuttings are rooted. Not 100%, but 85% or so can be expected. Not all plants do well as hardwood cuttings. As hardwood cuttings we do hydrangea, willows, rose of sharon, purple sandcherry and a few other things. Lots of other things can be done as hardwood cuttings, but Things that Root as Softwood Cuttings, we prefer to do them that way in the summer. On this page you’ll find a list of plants, and the best way to propagate them. Tag, tag, tag, tag!!!!!!!!! When growing plants for profit not only do your plants have to be tagged, but they have to be tagged with the correct name. We tag all of our cuttings, whether in buckets or in a bed of sand, we use these aluminum plant tags because the don’t fade. They are not super easy to read, especially if I write them, but the words are pressed into the aluminum so they do not fade. I just drill a hole in the lip of the bucket and attach the tag with wire. That way the tags cannot blow away or accidentally get lost. Everything you need to know about tagging is here! And trust me, proper tagging is more important than you can imagine! Mike! What if my cuttings freeze outside in the winter? No, it won’t kill them, they’ll be just fine. I can assure you, if you are growing plants that are hardy in your zone, freezing won’t harm them a bit. To me snow is like a “Silent Baby Sitter”. When my cuttings are covered in snow I know they are snuggled in tightly for the winter and resting peacefully. Like this . . . Both rooted and unrooted cuttings buried under snow. Yep! That’s how my cuttings are going to spend the winter. Fresh stuck hardwood cuttings, snow covered. As you can see, the cuttings that we just stuck in the bed on the left are barely showing. I assure you, they are fine. Happy as clams! Nursery pots filled with snow covered hardwood cuttings. Mike, how do we actually do hardwood cuttings? Glad you asked, The How to Is Here. How to actually make a cutting, See this Post I did Recently. Yeah, but does this Hocus Pocus hardwood cutting thing really work? Yep! It Sure Does, Here’s Proof. Questions, comments or mean things to say? Post them below. Hello Mike,, I’m new to this but I have many friends that send me cuttings. I tell them to wait until the tree is dormant and take the cuttings from that season. One friend sent me apple cuttings in mid December . I wrapped them in damp paper towel and put them in baggies. They were kept in the refrigerator until I could get to them in mid January . I that time I potted them in a 5 gal bucket with 50-50 peat moss and perlite . It’s now Feb. 19 and they are sprouting leaves. So my question is,,, is it to early for them to be sprouting and a month long enough for the cutting to have roots ? Can it sprout leaves without roots ? Thank you for your time and videos. Your cuttings do not have roots. Hardwood cuttings stuck in the winter won’t have enough roots to transplant until mid summer. Yes, they can make leaves without roots. Apples are going to be difficult as hardwood cuttings. Thank you Mike,, When is the best time to try the apple trees ? Hi Mike, I started some grapevines in course sand. They grew beautifully, when I took one out to see how well rooted it was, it seemed as though the sand cut the roots almost completely off. How would remove them without doing damage? You have to scoop under the cuttings and loosen the sand. It’s best to remove them when they are dormant unless you can do so without breaking roots. Hello Mike . Just a story of testimony. 10 yrs ago I had major shoulder surgery. For the next 9 months I had one functioning arm and a body full of pain medication. While laid up dazed and confused in bed ,, I rolled my head looking out the window to discover 6-8 inch seedlings as volunteers. As a joke I pulled up a number of seedlings and made an Ebay listing . SHOCKINGLY they Sold . 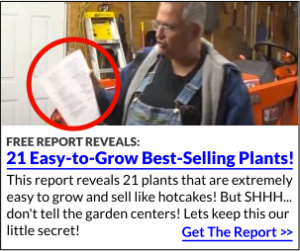 Thinking I now have an active way to make a useful hourly wage by selling seedlings with one arm … it’s only been recent that I was introduced to your web site . January I will be purchasing a license . YOU are the one that has taken me from 10 yrs of practicing to the next step level of my Nursery . Up till now I have been surviving, with your help and direction I will now flourish… thank you for giving confidence and courage to put my life back together again. I have a shrub that is called a Butterfly Bush but it is not one of the normal hardy BB’s. It is called a Tropical plant, so I bring it in each fall and it stays in the garage or in the house. Do you know how one would propagate these plants? I bought it about 6-8 years ago, and the place where I bought it, can’t remember having the plants. The flowers on the bush look so much like a butterfly. Real neat plant. Mike Can I plant a hardy pear tree now that I bought in October but never planted? We are having nice days now about 52 degrees with nights in 40’s . The previous month it was teens & 20’s. I had it in out of the cold but i wouild like to plant it now or would that shock it too much. ; I kow we will have more winter We are in SW Missouri 120 miles south of Kansas City. I think zone 5. By all means plant it. You can plant year round as long as the ground isn’t too frozen to dig. Plants are always happiest in the ground. Have kiwi plants and am interested to see if I can make hardwood cuttings with them. Has anyone tried this? Bought the kiwi a few years ago. The male must have died because as yet we haven’t received any kiwi fruit. Order 3 male kiwi for next year as we are going to put us 2 rows of kiwis. will have them sit with our other kiwi plants and see what happens. your plant heating pad where do I go to find them? what sizes do they come in? what should I expect to pay for one? They come in all sizes from a greenhouse supply store. Price? I have no idea but they can get expensive because most good ones need a separate thermostat. I have a 25 year old Old Gold Juniper that got over run with honey suckle vines and mimosa, etc. It is almost dead, but there is enough live sticking out that I could try to root some. (want some of THIS plant, because when I trimmed a limb off years ago-it re-sprouted from the trunk and grew a brand new limb-I don’t think junipers usually do this, do they? Anyway, I’m in a transition zone in East Tennessee (Smoky Mts. zone 6b/7a) and even though the temps were in the single digits for a couple of weeks, they have now been just below 50 in the day and around 23 or so at night. Can I still do hardwood cuttings in sand outside? Or do I need to do hardwood cuttings (and for how long) on a heat mat inside? I ideally do them inside now over a heat mat. That should work. You inspire me to new experiments! Thank you! I am living in Tennessee (once a northeast Ohioan!) I have Nandina’s for shrubs and wish to grow a few more. Pulled out the hollys as they grow too fast here and require too much pruning! These Nandinas are a shrub type that turn red in the winder. They do not loose their leaves and do not have berries like the native type. Are they a hardwood or softwood? Thank you! Love your articles. We use them in our garden club at times! Lots of things can be done either way, so I’d try some now while you are thinking of it, and if that doesn’t work try some in June. I like the simplicity of this method. I have two questions: first I read some descriptions that you bury hardwood cuttings first in the soil then dig them out and then stick them. Seems a bit cumbersome to me and I would probably forget about the buried cuttings…Why would one do that? I like willows but I would get in big trouble propagating them they are regarded as a weed here, were can I find a good list of plants that can be propagated via hardwood cuttings? elderberry? wormwoods? I did currents and Josta like this but we have a pesky borer in out area and I don’t do these plants anymore (until I found an organic solution to this problem). Yes, you can root cuttings in shade. But once they get roots and start growing they’ll do much better with some sunshine. Hi Mike, thank you so much for all the great information. I’m getting started on hardwood deciduous cuttings and read through all your info – but … I’m trying to do cuttings of river birch, white birch, and beech – however, I’m not finding pencil-thick branches with buds – rather, the new woody growth with buds is about 1/8″ thick at most. Will these work? If not, what am i missing? Most trees such as these are grown seed and not cuttings. Most don’t do well from cuttings. Specific varieties are then grafted or budded on to seedlings. But things like River Birch, white birch and standard beech can be grown from seed. Most seeds ripen in the fall. Me? I usually buy tree seedlings, but somebody has to grow them and there is a pretty strong market for them. internet a valuable positive asset – Wonderful holidays and a happy healthy 2017. Mike… I was hospitalized for 14 days this Summer and it took all of 10 days for the doctors to figure out I had Lyme. I was near death before they started the proper combination of antibiotics to kill the Lyme. The doctors took all 10 days to run tests and discover the cause. This is nothing to laugh at. Lyme is deadly. Wow Albert, I’m glad they got it figured out. The link to this page, received in the email posting, did not work for my computer(s). I sent the error message(s) to the “support team” (which turned out to be Mike) and he fixed me up. HI Mike, I have been rooting cuttings for many years, not for sale or on a big scale but just because I get a kick out of it! I have rooted roses, hydrangeas, Forsythia, Althea, azaleas, I have also rooted Dragon wing begonias, and am currently trying to root a jade plant, I found a couple of pieces that were broken of a big plant. I also have a Kalanchoe that has rooted from a leaf, I’m hoping it will bloom next year.. Your site is very informative. Keep up the good work. I am eighty years old and now live in Jacksonville, Florida. where it’s supposed to be near 80 degrees tomorrow! I live in Florida, it never freezes. Does that matter? No, it doesn’t matter, your plants still go dormant in the winter. You’ll just have to water or wet your cuttings more in the winter that I do. We’re in central NC (zone 7b). The early hardy camellias are in bloom now. So not dormant? Can I do hardwood cuttings on these camellias now? Camellias late-August, outside, mist, bottom heat. Leave in propagation flat at least a full year. Roots very reliably. Just want to wish you happy holidays and thank you for one of the few regular postings that is ALWAYS a valuable read.